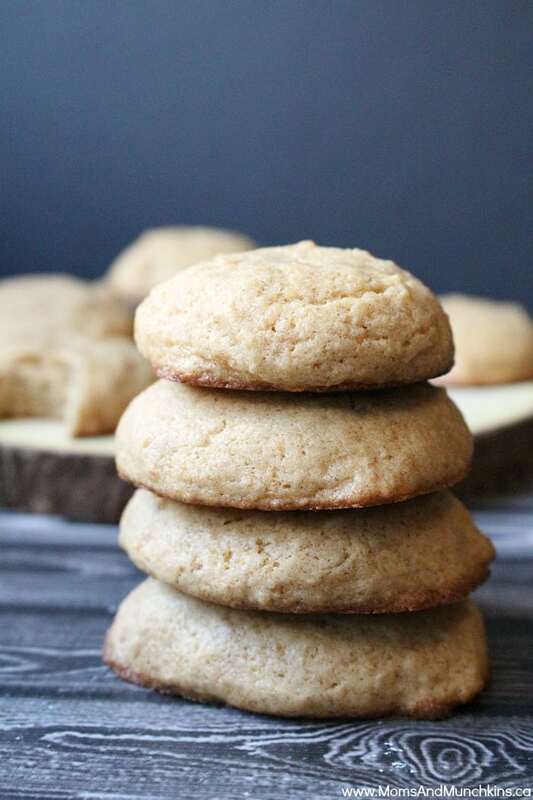 I struggled with what to call these cookies – Applesauce Cookies or Apple Muffin Top Cookies. They are so soft and fluffy that they taste like the top of a muffin but they are indeed a cookie. I baked these tonight and it’s a good thing I doubled the batch because my dad, mom, and son were all gobbling these up as soon as they’d come out of the oven. I may have had a couple myself (or three) strictly for research purposes…of course. These are really easy to make but they disappear quickly. This recipe makes about 18-20 cookies. Some readers have said that their cookies spread too much during baking and aren’t rising. I’ve made this recipe several times and haven’t had that problem but a solution could be refrigerating the dough for a couple of hours before scooping into cookies for baking. This recipe makes 18-20 cookies. 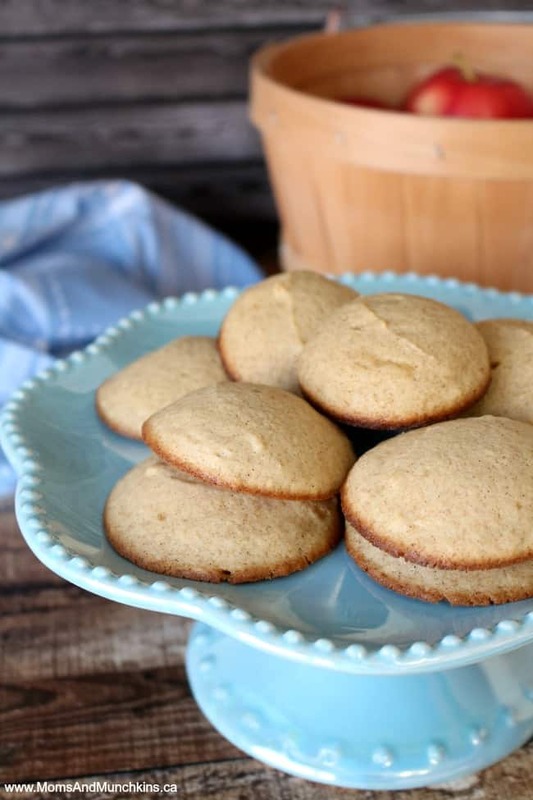 These are fluffy, soft cookies that disappear quickly from the cookie jar! In a medium bowl, stir together flour, baking powder, salt and cinnamon until mixed well. Put this bowl to the side. In a large bowl, beat applesauce, brown sugar and butter with an electric mixer on medium speed until mixed well (about 2 minutes). Gradually add flour mixture to applesauce mixture while beating on low speed until blended well. Place cookies (2-tablespoon sized) onto silicone mat lined baking sheet about 2 inches apart from each other. Bake for 10 minutes. Let cool for 5 minutes on cookie sheet before removing. How do you prefer your cookies? Soft & chewy or hard & crunchy? I’ll always choose the soft cookies over the crunchy ones. Maybe it’s because they remind me of cake and I love cake. For more delicious recipe ideas, visit our Easy Recipes & Family Meals page. We’re always adding new & delicious ideas. Stay updated on the latest by following us on Facebook, Twitter, Pinterest, and Instagram. These sound good. 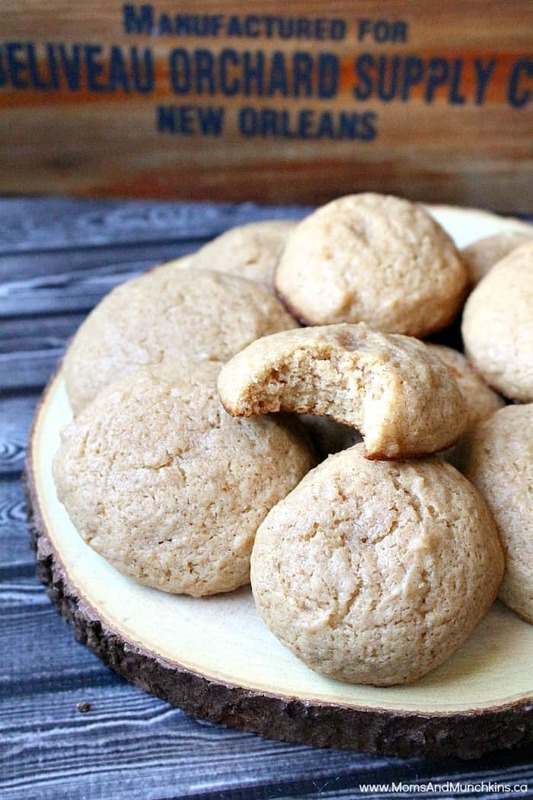 My kids are always asking for apple pancakes so maybe I will make them some apple cookies too! Hi Stefani! Yes, even my dad (the pickiest eater!) was gobbling these up. I hope you enjoy them! Just made these tonight for a 4 year olds birthday tomorrow, and lets just say that they aren’t making it to the party. I literally have to wake up tomorrow morning and make a double batch. Soooo delicious. Just like warm apple sponge cake. Ps. for those of you making these for the first time, do not be discouraged if your batter turns out liquid, mine did, and although the batter went on to the baking sheet pretty thinly, they rose perfectly and turned out great. Just a runny batter. Hi Kathryn! Thank you for your kind words and I’m happy to hear that you enjoyed them! I hope you had a great birthday party! So I just made these and they are flat as a pancake. I don’t know what happened! They still taste amazing, but my family laughed when they saw them. What went wrong? I had the exact same problem! They were more sticky and gooey instead of fluffy. Isn’t there too much sugar in this recipe? Hi Alicia! Sorry that they didn’t turn out for you. Maybe you could try chilling the dough in the refrigerator for a couple of hours before scooping? Just made these. I didn’t put in as much sugar as the recipe calls because I’m making them for my toddler (tried 1/2 cup and a bit of honey instead). They still turned out pretty sweet. Next time I’ll use even less sugar. Quite tasty! And my toddler definitely approves!